Enjoy the Music.com is leading the way as we produced our live streaming broadcasts showcasing high-end audio consumer electronics for music lovers and audiophiles alike. We featured everything from headphones to amplifiers, DACs to loudspeakers and much more! We also had a few surprise gusts along the way! 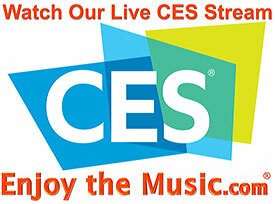 Enjoy the Music.com's sister site, Enjoy the Music.TV, live streamed many hours of CES 2015 show coverage. If you missed our live broadcast, we have highlights from our live broadcast below. As always, in the end what really matters is that you... enjoy the music! ---> Back To main CES 2015 page.